Philadelphia (/ˌfɪləˈdɛlfiə/) is the largest city in the U.S. state and Commonwealth of Pennsylvania, and the sixth-most populous U.S. city, with a 2017 census-estimated population of 1,580,863. Since 1854, the city has been coterminous with Philadelphia County, the most populous county in Pennsylvania and the urban core of the eighth-largest U.S. metropolitan statistical area, with over 6 million residents as of 2017. Philadelphia is also the economic and cultural anchor of the greater Delaware Valley, located along the lower Delaware and Schuylkill Rivers, within the Northeast megalopolis. The Delaware Valley's population of 7.2 million ranks it as the eighth-largest combined statistical area in the United States. William Penn, an English Quaker, founded the city in 1682 to serve as capital of the Pennsylvania Colony. Philadelphia played an instrumental role in the American Revolution as a meeting place for the Founding Fathers of the United States, who signed the Declaration of Independence in 1776 at the Second Continental Congress, and the Constitution at the Philadelphia Convention of 1787. Several other key events occurred in Philadelphia during the Revolutionary War including the First Continental Congress, the preservation of the Liberty Bell, the Battle of Germantown, and the Siege of Fort Mifflin. Philadelphia was one of the nation's capitals during the revolution, and served as temporary U.S. capital while Washington, D.C., was under construction. In the 19th century, Philadelphia became a major industrial center and a railroad hub. The city grew from an influx of European immigrants, most of whom came from Ireland, Italy and Germany—the three largest reported ancestry groups in the city as of 2015. In the early 20th century, Philadelphia became a prime destination for African Americans during the Great Migration after the Civil War, as well as Puerto Ricans. The city's population doubled from one million to two million people between 1890 and 1950. Before Europeans arrived, the Philadelphia area was home to the Lenape (Delaware) Indians in the village of Shackamaxon. The Lenape are a Native American tribe and First Nations band government. They are also called Delaware Indians, and their historical territory was along the Delaware River watershed, western Long Island, and the Lower Hudson Valley. [lower-alpha 1] Most Lenape were pushed out of their Delaware homeland during the 18th century by expanding European colonies, exacerbated by losses from intertribal conflicts. Lenape communities were weakened by newly introduced diseases, mainly smallpox, and violent conflict with Europeans. Iroquois people occasionally fought the Lenape. Surviving Lenape moved west into the upper Ohio River basin. The American Revolutionary War and United States' independence pushed them further west. In the 1860s, the United States government sent most Lenape remaining in the eastern United States to the Indian Territory (present-day Oklahoma and surrounding territory) under the Indian removal policy. In the 21st century, most Lenape reside in Oklahoma, with some communities living also in Wisconsin, Ontario (Canada) and their traditional homelands. Europeans came to the Delaware Valley in the early 17th century, with the first settlements founded by the Dutch, who in 1623 built Fort Nassau on the Delaware River opposite the Schuylkill River in what is now Brooklawn, New Jersey. The Dutch considered the entire Delaware River valley to be part of their New Netherland colony. In 1638, Swedish settlers led by renegade Dutch established the colony of New Sweden at Fort Christina (present-day Wilmington, Delaware) and quickly spread out in the valley. In 1644, New Sweden supported the Susquehannocks in their military defeat of the English colony of Maryland. In 1648, the Dutch built Fort Beversreede on the west bank of the Delaware, south of the Schuylkill near the present-day Eastwick neighborhood, to reassert their dominion over the area. The Swedes responded by building Fort Nya Korsholm, or New Korsholm, after a town in Finland with a Swedish majority. In 1655, a Dutch military campaign led by New Netherland Director-General Peter Stuyvesant took control of the Swedish colony, ending its claim to independence. The Swedish and Finnish settlers continued to have their own militia, religion, and court, and to enjoy substantial autonomy under the Dutch. The English conquered the New Netherland colony in 1664, though the situation did not change substantially until 1682 when the area was included in William Penn's charter for Pennsylvania. By the 20th century, Philadelphia had become known as "corrupt and contented", with an entrenched Republican political machine and a complacent population. The first major reform came in 1917 when outrage over the election-year murder of a police officer led to the shrinking of the City Council from two houses to just one. In July 1919, Philadelphia was one of more than 36 industrial cities nationally to suffer a race riot of ethnic whites against blacks during Red Summer, in post-World War I unrest, as recent immigrants competed with blacks for jobs. In the 1920s, the public flouting of Prohibition laws, organized crime, mob violence, and police involvement in illegal activities led to the appointment of Brig. Gen. Smedley Butler of the U.S. Marine Corps as director of public safety, but political pressure prevented any long-term success in fighting crime and corruption. The lowest point is 10 feet (3 m) above sea level, while the highest point is in Chestnut Hill, about 445 feet (136 m) above sea level near the intersection of Germantown Avenue and Bethlehem Pike. Philadelphia's central city was created in the 17th century following the plan by William Penn's surveyor Thomas Holme. Center City is structured with long straight streets running nearly due east-west and north-south, forming a grid pattern between the Delaware and Schuylkill rivers that is aligned with their courses. The original city plan was designed to allow for easy travel and to keep residences separated by open space that would help prevent the spread of fire. Penn planned the creation of five public parks in the city which were renamed in 1824 (new names in parenthesis): Centre Square (Penn Square), Northeast Square (Franklin Square), Southeast Square (Washington Square), Southwest Square (Rittenhouse Square), and Northwest Square (Logan Circle/Square). Center City had an estimated 183,240 residents as of 2015, making it the second-most populated downtown area in the United States, after Midtown Manhattan in New York City. In 1932, Philadelphia became home to the first modern International Style skyscraper in the United States, the PSFS Building, designed by George Howe and William Lescaze. The 548 ft (167 m) City Hall remained the tallest building in the city until 1987 when One Liberty Place was completed. Numerous glass and granite skyscrapers were built in Center City beginning in the late 1980s. In 2007, the Comcast Center surpassed One Liberty Place to become the city's tallest building. The Comcast Technology Center is under construction in Center City with an expected completion in 2018. The new tower will reach a height of 1,121 ft (342 m), and will be the tallest building in the United States outside of Manhattan and Chicago. According to the Köppen climate classification, Philadelphia falls under the northern periphery of the humid subtropical climate zone (Köppen Cfa), whereas according to the Trewartha climate classification, the city has a temperate maritime climate (Do). Summers are typically hot and muggy, fall and spring are generally mild, and winter is moderately cold. The plant life hardiness zones are 7a and 7b, representing an average annual extreme minimum temperature between 0 °F (−18 °C) and 10 °F (−12 °C). Snowfall is highly variable with some winters having only light snow while others include major snowstorms. The normal seasonal snowfall averages 22.4 in (57 cm), with rare snowfalls in November or April, and rarely any sustained snow cover. 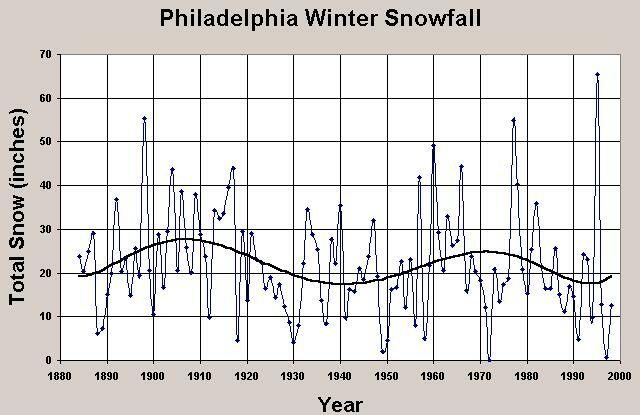 Seasonal snowfall accumulation has ranged from trace amounts in 1972–73 to 78.7 inches (200 cm) in the winter of 2009–10. [lower-alpha 2] The city's heaviest single-storm snowfall was 30.7 in (78 cm) which occurred in January 1996. The January daily average temperature is 33.0 °F (0.6 °C), though the temperature frequently rises to 50 °F (10 °C) during thaws and dips to 10 °F (−12 °C) for 2 or 3 nights in a normal winter. July averages 78.1 °F (25.6 °C), although heat waves accompanied by high humidity and heat indices are frequent, with highs reaching or exceeding 90 °F (32 °C) on 27 days of the year. The average window for freezing temperatures is November 6 thru April 2, allowing a growing season of 217 days. Early fall and late winter are generally dry with February having the lowest average precipitation at 2.64 inches (67 mm). The dewpoint in the summer averages between 59.1 °F (15 °C) and 64.5 °F (18 °C). The highest recorded temperature was 106 °F (41 °C) on August 7, 1918, but temperatures at or above 100 °F (38 °C) are not common. [lower-alpha 3] The lowest officially recorded temperature was −11 °F (−24 °C) on February 9, 1934. Temperatures at or below 0 °F (−18 °C) are rare with the last such occurrence being January 19, 1994. The record low maximum is 5 °F (−15 °C) on February 10, 1899, and December 30, 1880, while the record high minimum is 83 °F (28 °C) on July 23, 2011, and July 24, 2010. According to the 2017 United States Census Bureau estimate, there were 1,580,863 people residing in Philadelphia, representing a 3.6% increase from the 2010 census. After the 1950 Census, when a record high of 2,071,605 was recorded, the city's population began a long decline. The population dropped to a low of 1,488,710 residents in 2006 before beginning to rise again. Between 2006 and 2017, Philadelphia added 92,153 residents. In 2015, the Census Bureau estimated that the racial composition of the city was 41.5% Black (non-Hispanic), 35.8% White (non-Hispanic), 13.4% Hispanic or Latino, 6.8% Asian, 0.2% Native Americans, 0.03% Pacific Islanders, and 2.0% multiracial. The 2010 Census redistricting data indicated that the racial makeup of the city was 644,287 (42.2%) Black (non-Hispanic), 562,585 (36.9%) White (non-Hispanic), 96,405 (6.3%) Asian (2.0% Chinese, 1.2% Indian, 0.9% Vietnamese, 0.4% Korean, 0.3% Filipino, 0.1% Japanese, and 1.4% other), 6,996 (0.5%) Native Americans, 744 (0.05%) Pacific Islanders, and 43,070 (2.8%) from two or more races. Hispanic or Latino of any race were 187,611 persons (12.3%); 8.0% of Philadelphia is Puerto Rican, 1.0% Mexican, 0.3% Cuban, and 3.0% other. The racial breakdown of Philadelphia's Hispanic/Latino population was 63,636 (33.9%) White, 17,552 (9.4%) Black, 3,498 (1.9%) Native American, 884 (0.47%) Asian, 287 (0.15%) Pacific Islander, 86,626 (46.2%) from other races, and 15,128 (8.1%) from two or more races. The five largest European ancestries reported in the 2010 Census included Irish (13.0%), Italian (8.3%), German (8.2%), Polish (3.9%), and English (3.1%). The estimated average population density was 11,782 people per square mile (4,549/km²) in 2017. In 2010, the Census Bureau reported that 1,468,623 people (96.2% of the population) lived in households, 38,007 (2.5%) lived in non-institutionalized group quarters, and 19,376 (1.3%) were institutionalized. In 2013, the city reported having 668,247 total housing units, down slightly from 670,171 housing units in 2010. As of 2013, 87 percent of housing units were occupied, while 13 percent were vacant, a slight change from 2010 where 89.5 percent of units were occupied, or 599,736 and 10.5 percent were vacant, or 70,435. Of the city's residents, 32 percent reported having no vehicles available while 23 percent had two or more vehicles available, as of 2013. During the last decade, Philadelphia experienced a large shift in its age profile. In 2000, the city's population pyramid had a largely stationary shape. In 2013, the city took on an expansive pyramid shape, with an increase in the three millennial age groups, 20 to 24, 25 to 29, and 30 to 34. The city's 25- to 29-year-old age group was the city's largest age cohort. According to the 2010 Census, 343,837 (22.5%) were under the age of 18; 203,697 (13.3%) from 18 to 24; 434,385 (28.5%) from 25 to 44; 358,778 (23.5%) from 45 to 64; and 185,309 (12.1%) who were 65 years of age or older. The median age was 33.5 years. For every 100 females, there were 89.4 males. For every 100 females age 18 and over, there were 85.7 males. The city had 22,018 births in 2013, down from a peak 23,689 births in 2008. Philadelphia's death rate was at its lowest in at least a half-century, 13,691 deaths in 2013. Another factor attributing to the population increase is Philadelphia's rising immigration rate. Like the millennial population, Philadelphia's immigrant population is also growing rapidly; according to a study by the Pew Charitable Trusts, the city's foreign-born population had increased by 69% between 2000 and 2016 to constitute nearly 20% of Philadelpia's work force. Philadelphia is also home to a significant gay and lesbian population. Philadelphia's Gayborhood, which is located near Washington Square, is home to a large concentration of gay and lesbian friendly businesses, restaurants, and bars. Philadelphia's Asian American population originated mainly from China, India, Vietnam, South Korea, and the Philippines. Over 35,000 Chinese Americans made their home within Philadelphia city proper alone in 2015, including a large Fuzhounese population, and the city hosts a growing Chinatown accommodating heavily traveled Chinese-owned bus lines to and from Chinatown, Manhattan in New York City. While a large Korean community initially settled in the North Philadelphia neighborhood of Olney, the primary Koreatown has subsequently evolved in North Philadelphia straddling the border with the northern suburb of Cheltenham, in Montgomery County. South Philadelphia is also home to large Cambodian, Vietnamese, and Chinese communities. Philadelphia has the fifth largest Muslim population among American cities. The traditional Philadelphia accent that is considered by some linguists to be the most distinctive accent in North America is fading out. The dialect, which is spread throughout the Delaware Valley and South Jersey, is part of Mid-Atlantic American English, a designation that also includes the Baltimore dialect. Additionally, it shares many similarities with the New York accent. Thanks to over a century of linguistic data collected by researchers at the University of Pennsylvania under sociolinguist William Labov, the Philadelphia dialect has been one of the best-studied forms of American English. [lower-alpha 7] The accent is traditionally found within the Irish American and Italian American working-class neighborhoods. Philadelphia also has its own unique collection of neologisms and slang terms. Philadelphia is the center of economic activity in Pennsylvania with the headquarters of five Fortune 1000 companies located within city limits. According to the Bureau of Economic Analysis, the Philadelphia area had a total gross domestic product of $431 billion in 2016, the eighth-largest metropolitan economy in the United States. Philadelphia was rated by the GaWC as a 'Beta' city in its 2016 ranking of world cities. Philadelphia International Airport is undergoing a $900 million infrastructural expansion to increase passenger capacity and augment passenger experience; while the Port of Philadelphia, having experienced the highest percentage growth by tonnage loaded in 2017 among major U.S. seaports, was in the process of doubling its capacity in order to accommodate super-sized post-Panamax shipping vessels in 2018. Philadelphia's economic sectors include financial services, health care, biotechnology, information technology, manufacturing, oil refining, food processing, and tourism. Financial activities account for the largest economic sector of the metropolitan area, which is also one of the largest health education and research centers in the United States. Philadelphia's annualized unemployment rate was 7.8% in 2014, down from 10% the previous year. This is higher than the national average of 6.2%. Similarly, the rate of new jobs added to the city's economy lagged behind the national job growth. In 2014, about 8,800 jobs were added to the city's economy. Sectors with the largest number of jobs added were in education and health care, leisure and hospitality, and professional and business services. Declines were seen in the city's manufacturing and government sectors. Education in Philadelphia is provided by many private and public institutions. The School District of Philadelphia runs the city's public schools. The Philadelphia School District is the eighth largest school district in the United States with 142,266 students in 218 traditional public schools and 86 charter schools as of 2014. The city's professional teams and their fans endured 25 years without a championship, from the 76ers 1983 NBA Finals win until the Phillies 2008 World Series win. The lack of championships was sometimes attributed in jest to the Curse of Billy Penn after One Liberty Place became the first building to surpass the height of the William Penn statue on top of City Hall's tower in 1987. After ten years passed without another championship, the Eagles won their first Super Bowl in 2018. In 2004, ESPN placed Philadelphia second on its list of The Fifteen Most Tortured Sports Cities. Fans of the Eagles and Phillies were singled out as the worst fans in the country by GQ magazine in 2011, which used the subtitle of "Meanest Fans in America" to summarize incidents of drunken behavior and a history of booing. The Philadelphia Spinners were a professional ultimate team in Major League Ultimate (MLU) until 2016. The Spinners were one of the original eight teams of the American Ultimate Disc League (AUDL) that began in 2012. They played at Franklin Field and won the inaugural AUDL championship and the final MLU championship in 2016. The MLU was suspended indefinitely by its investors in December 2016. As of 2018, the Philadelphia Phoenix continue to play in the AUDL. As of 2014, the total city parkland, including municipal, state and federal parks within the city limits, amounts to 11,211 acres (17.5 sq mi). Philadelphia's largest park is Fairmount Park which includes the Philadelphia Zoo and encompasses 2,052 acres (3.2 sq mi) of the total parkland, while the adjacent Wissahickon Valley Park contains 2,042 acres (3.2 sq mi). Fairmount Park, when combined with Wissahickon Valley Park, is one of the largest contiguous urban park areas in the United States. The two parks, along with the Colonial Revival, Georgian and Federal-style mansions contained in them, have been listed as one entity on the National Register of Historic Places since 1972. As of 2018, the city's District Attorney is Larry Krasner, a Democrat. The last Republican to hold the office is Ronald D. Castille, who left in 1991 and later served as the Chief Justice of the Pennsylvania Supreme Court from 2008 to 2014. As a result of the declining population in the city and state, Philadelphia has only three congressional districts of the 18 districts in Pennsylvania, based on the 2010 Census apportionment: the 1st district, represented by Bob Brady; the 2nd, represented by Dwight Evans; and the 13th, represented by Brendan Boyle. All three representatives are Democrats though Republicans still have some support in the city, primarily in the Northeast. Sam Katz ran competitive mayoral races as the Republican nominee in 1999 and 2003, losing to Democrat John Street both times. In 2004, there were 7,513.5 crimes per 200,000 people in Philadelphia. Among its neighboring mid-Atlantic cities in the same population group, Baltimore and Washington, D.C. were ranked second- and third-most dangerous cities in the United States, respectively. Camden, New Jersey, a city directly across the Delaware River from Center City, was ranked as the most dangerous city in the United States. In 2014, Philadelphia decriminalized small amounts of marijuana, reducing penalties for possession and public use to minor fines and community service. The move makes Philadelphia the largest city in the United States to decriminalize pot. Philadelphia's two major daily newspapers are The Philadelphia Inquirer, first published in 1829—the third-oldest surviving daily newspaper in the country—and the Philadelphia Daily News, first published in 1925. The Daily News has been published as an edition of the Inquirer since 2009. Recent owners of the Inquirer and Daily News have included Knight Ridder, The McClatchy Company, and Philadelphia Media Holdings, with the latter organization declaring bankruptcy in 2010. After two years of financial struggle, the newspapers were sold to Interstate General Media in 2012. The two newspapers had a combined daily circulation of 306,831 and a Sunday circulation of 477,313 in 2013—the eighteenth largest circulation in the country—while the website of the newspapers, Philly.com, was ranked thirteenth in popularity among online U.S. newspapers by Alexa Internet for the same year. As of 2018, the FCC lists 28 FM and 11 AM stations for Philadelphia. As of December 2017, the ten highest-rated stations in Philadelphia were adult contemporary WBEB-FM (101.1), sports talk WIP-FM (94.1), classic rock WMGK-FM (102.9), urban adult contemporary WDAS-FM (105.3), classic hits WOGL-FM (98.1), album-oriented rock WMMR-FM (93.3), country music WXTU-FM (92.5), all-news KYW-AM (1060), talk radio WHYY-FM (90.9), and urban adult contemporary WRNB-FM (100.3). Philadelphia is served by three non-commercial public radio stations: WHYY-FM (NPR), WRTI-FM (classical and jazz), and WXPN-FM (adult alternative music). As of 2018, the city is the nation's fourth-largest consumer in media market, as ranked by the Nielsen Media Research firm, with nearly 2.9 million TV households. Interstate 95 (the Delaware Expressway) traverses the southern and eastern edges of the city along the Delaware River as the main north-south controlled-access highway. The city is also served by Interstate 76 (the Schuylkill Expressway) which runs along the Schuylkill River, intersecting the Pennsylvania Turnpike at King of Prussia and providing access to Harrisburg and points west. Interstate 676 (the Vine Street Expressway) links I-95 and I-76 through Center City by running below street level between the eastbound and westbound lanes of Vine Street. Entrance and exit ramps for the Benjamin Franklin Bridge are near the eastern end of the expressway, just west of the I-95 interchange. Philadelphia is a hub for Greyhound Lines. The Greyhound terminal is located at 1001 Filbert Street (at 10th Street) in Center City, southeast of the Pennsylvania Convention Center and south of Chinatown. Several other bus operators provide service at the Greyhound terminal including Bieber Transportation Group, Fullington Trailways, Martz Trailways, Peter Pan Bus Lines, and New Jersey Transit buses. Other intercity bus services include Megabus with stops at 30th Street Station and the visitor center for Independence Hall, and BoltBus (operated by Greyhound) at 30th Street Station. Philadelphia is a regional hub of the federally owned Amtrak system, with 30th Street Station being a primary stop on the Washington-Boston Northeast Corridor and the Keystone Corridor to Harrisburg and Pittsburgh. 30th Street also serves as a major station for services via the Pennsylvania Railroad's former Pennsylvania Main Line to Chicago. As of 2017, 30th Street is Amtrak's third-busiest station in the country, after New York City and Washington. Southeastern Pennsylvania was assigned the 215 area code in 1947 when the North American Numbering Plan of the Bell System went into effect. The geographic area covered by the code was split nearly in half in 1994 when area code 610 was created, with the city and its northern suburbs retaining 215. Overlay area code 267 was added to the 215 service area in 1997, and 484 was added to the 610 area in 1999. A plan in 2001 to introduce a third overlay code to both service areas (area code 445 to 215, area code 835 to 610) was delayed and later rescinded. In 2005, a low-cost, citywide Wi-Fi service was approved for installation in the city. Wireless Philadelphia would have been the first municipal internet utility in a large U.S. city, but the plan was abandoned in 2008 as EarthLink pushed back the completion date several times. Mayor Nutter's administration closed the project in 2009 after an attempt to revitalize it failed. Philadelphia has dedicated landmarks to its sister cities. The Sister Cities Park, a site of 0.5 acres (2,400 sq yd) located at 18th and Benjamin Franklin Parkway within Logan Square, was dedicated in June 1976. The park was built to commemorate Philadelphia's first two sister city relationships, with Tel Aviv and Florence. The Toruń Triangle, honoring the sister city relationship with Toruń, Poland, was constructed in 1976, west of the United Way building at 18th Street and the Benjamin Franklin Parkway. Sister Cities Park was redesigned and reopened in 2012, featuring an interactive fountain honoring Philadelphia's sister and partnership cities, a café and visitor's center, children's play area, outdoor garden, and boat pond, as well as a pavilion built to environmentally friendly standards. 1 2 3 4 5 "Annual Estimates of the Resident Population for Incorporated Places of 50,000 or More, Ranked by July 1, 2017 Population". United States Census Bureau. Retrieved May 24, 2018. 1 2 "Estimates of Resident Population Change and Rankings: July 1, 2016 to July 1, 2017 - United States -- Metropolitan Statistical Area; and for Puerto Rico; 2017 Population Estimates". United States Census Bureau, Population Division. March 2018. Retrieved May 14, 2018. 1 2 "Annual Estimates of the Resident Population: April 1, 2010 to July 1, 2017 - United States -- Combined Statistical Area; and for Puerto Rico; 2017 Population Estimates". United States Census Bureau, Population Division. March 2018. Retrieved May 14, 2018. 1 2 "Gross Metropolitan Product". U.S. Bureau of Economic Analysis. September 20, 2017. Retrieved November 26, 2017. ↑ "Mural Arts Philadelphia – Press kit" (PDF). muralarts.org. Mural Arts Philadelphia. Retrieved December 6, 2017. Mural Arts Philadelphia is the nation’s largest public art program...creating nearly 4,000 artworks that have transformed public spaces. ↑ Amy He (June 17, 2017). "Chinese company helps boost Philadelphia as biotech sector". China Daily. Retrieved December 10, 2017. ↑ "The Nine Capitals of the United States". United States Senate. Retrieved December 5, 2017. 1 2 "Consolidation Act of 1854". Retrieved September 17, 2014. ↑ "2016 U.S. Gazetteer Files". United States Census Bureau. Retrieved May 25, 2018. 1 2 3 4 5 6 7 8 9 "NowData – NOAA Online Weather Data". National Oceanic and Atmospheric Administration. Retrieved December 14, 2011. ↑ Lipman, Don (2013-01-07). "One wild storm: A look back at the 'Blizzard of '96'". Washington Post. Retrieved 2017-12-19. 1 2 "WMO Climate Normals for PHILADELPHIA/INT'L ARPT PA 1961–1990". National Oceanic and Atmospheric Administration. Retrieved 2014-03-11. ↑ Wood, Anthony R. "Snow total at airport gets a boost A new measuring station and technique likely contributed to two 8-inch-plus readings". Philly.com. The Inquirer. Archived from the original on 2014-07-28. Retrieved 2014-06-10. 1 2 "2011–2015 American Community Survey 5-Year Estimates". United States Census Bureau. Retrieved December 5, 2017. ↑ "2011-2015 American Community Survey Selected Population Tables - Chinese alone, Philadelphia County, Pennsylvania". United States Census Bureau. Retrieved June 3, 2018. ↑ "Fortune 500 2017". Fortune. Retrieved November 25, 2017. ↑ "The World According to GaWC 2016". Globalization and World Cities Research Network. Retrieved November 26, 2017. ↑ Linda Loyd (August 22, 2017). "Philly airport gets $16.5 million federal grant for runway improvements". The Philadelphia Inquirer. Retrieved June 3, 2018. ↑ "Art: Windfall". Time. January 15, 1940. Retrieved March 2, 2018. ↑ Van Hook, Bailey (2009-01-01). "The Early Career of Violet Oakley, Illustrator". Woman's Art Journal. 30 (1): 29–38. JSTOR 40605220. ↑ Stuhldreher, Katie (30 July 2007). "Rick's Steaks takes Reading Terminal Market dispute to court". philly.com. Archived from the original on 24 January 2008. Retrieved 30 July 2007. ↑ "Athletics (Philadelphia) (1871-1876)". retrosheet.org. Retrieved March 6, 2018. ↑ "2008 World Series: Philadelphia Phillies over Tampa Bay Rays (4-1)". baseball-reference.com. Retrieved March 6, 2018. ↑ Charlie Eisenhood (December 8, 2016). "A Philly Talent Skirmish Highlights Waning Battle Between AUDL, MLU". ultiworld.com. Retrieved March 6, 2018. ↑ Charlie Eisenhood (December 21, 2016). "Major League Ultimate Suspends Operations: The league's investors pulled funding". ultiworld.com. Retrieved March 6, 2018. ↑ "Philadelphia Phoenix history". theaudl.com. Retrieved March 6, 2018. ↑ "History: A Family of Philadelphia Rivals". philadelphiabig5.org. Philadelphia Big 5. Retrieved April 9, 2018. ↑ Mike DeCourcy (April 5, 2016). "Villanova beating UNC was the greatest NCAA championship game ever, period". sportingnews.com. Retrieved March 6, 2018. ↑ Schonbrun, Zach (April 2, 2018). "Juggernaut Villanova Crushes Michigan for N.C.A.A. Championship". The New York Times. Retrieved April 9, 2018. ↑ "National Register of Historic Places – Fairmount Park – #72001151". focus.nps.gov. National Park Service. February 7, 1972. Archived from the original on December 30, 2016. Retrieved January 6, 2017. Locations: Philadelphia ; Both banks of Schuylkill River and Wissahickon Creek, from Spring Garden St. to Northwestern Ave.
1 2 "City Charter Commission". Agency History. City of Philadelphia, Department of Records. November 8, 2000. Retrieved April 18, 2009. 1 2 Charter Commission (1967) . "Philadelphia Home Rule Charter, Annotated" (PDF). City of Philadelphia. Archived from the original (PDF) on May 25, 2010. Retrieved January 31, 2010. ↑ "Third Judicial Circuit". Retrieved June 2, 2012. ↑ "U.S. District Court, Eastern District of Pennsylvania". Retrieved June 2, 2012. ↑ "Trial Division". courts.phila.gov. First Judicial District of Pennsylvania. Retrieved February 6, 2018. ↑ "Family Division". courts.phila.gov. First Judicial District of Pennsylvania. Retrieved February 6, 2018. ↑ "Orphans' Court". courts.phila.gov. First Judicial District of Pennsylvania. Retrieved February 6, 2018. ↑ Chris Brennan & Aubrey Whelan (November 7, 2017). "Larry Krasner wins race for Philly DA". philly.com. Philadelphia Inquirer. Retrieved February 6, 2018. ↑ Peter Hall (January 10, 2015). "Retiring Chief Justice Castille says he kept faith in fellow jurists". mcall.com. The Morning Call. Retrieved February 6, 2018. ↑ "Membership requirements for the Minor Judiciary Education Board". pacourts.us. The Unified Judicial System of Pennsylvania. Retrieved February 6, 2018. ↑ "Courts>Supreme Court>Calendar". pacourts.us. The Unified Judicial System of Pennsylvania. Retrieved February 6, 2018. ↑ "Courts>Superior Court>Calendar". pacourts.us. The Unified Judicial System of Pennsylvania. Retrieved February 6, 2018. ↑ "Courts>Commonwealth Court>Calendar". pacourts.us. The Unified Judicial System of Pennsylvania. Retrieved February 6, 2018. ↑ "How Judges Are Elected". pacourts.us. The Unified Judicial System of Pennsylvania. Retrieved February 6, 2018. ↑ "Supreme Court Prothonotary's Addresses". pacourts.us. The Unified Judicial System of Pennsylvania. Retrieved February 6, 2018. ↑ "Superior Court Prothonotary's Addresses". pacourts.us. The Unified Judicial System of Pennsylvania. Retrieved February 6, 2018. ↑ "Court Info » Court Locations - Philadelphia". uscourts.gov. United States District Court for the Eastern District of Pennsylvania. Retrieved February 6, 2018. ↑ "About the Court » Court Location - Philadelphia". uscourts.gov. United States Court of Appeals for the Third Circuit. Retrieved February 6, 2018. ↑ Cuellar, Dann (November 4, 2015). "Jim Kenney elected mayor of Philadelphia". 6abc.com. ABC Inc., WPVI-TV. Retrieved February 28, 2018. ↑ "Michael Nutter easily wins a second term in City Hall". The Economist. November 12, 2011. Retrieved February 28, 2018. ↑ "The Philadelphia Code | Philadelphia Home Rule Charter | Article II Legislative Branch The Council - Its Election, Organization, Powers and Duties | Chapter 1 The Council | § 2-100. Number, Terms and Salaries of Councilmen". library.amlegal.com. American Legal Publishing Corp. Retrieved February 28, 2018. ↑ "Council Members". phlcouncil.com. The Council of the City of Philadelphia. Retrieved February 28, 2018. 1 2 "The Administration of Voter Registration in Pennsylvania-2016 Report to the General Assembly" (PDF). PA Department of State. June 2017. Retrieved July 27, 2017. 1 2 Leip, David. "Dave Leip's Atlas of U.S. Presidential Elections". uselectionatlas.org. ↑ Keels, Thomas H. (2016). "Contractor Bosses (1880s to 1930s)". philadelphiaencyclopedia.org. The Encyclopedia of Greater Philadelphia. Retrieved March 1, 2018. ↑ "Long before 2016 craziness, there was Philadelphia 1935". philly.com. The Philadelphia Inquirer. September 25, 2016. Retrieved March 1, 2018. ↑ "The Birth Of The Republican Party". republicanviews.org. Republican Views. August 29, 2015. Retrieved March 1, 2018. ↑ Kristin D. Burnett (November 2011). "Congressional Apportionment 2010 Census Briefs" (PDF). United States Census Bureau. Retrieved March 1, 2018. ↑ "Pennsylvania is currently represented by 18 individuals in the 435-member United States House of Representatives. Three districts cover parts of Philadelphia." Archived March 1, 2018, at the Wayback Machine.. seventy.org. Committee of Seventy. Retrieved March 1, 2018. ↑ "Congress / Members of Congress / Pennsylvania". govtrack.us. Civic Impulse, LLC. Retrieved March 1, 2018. ↑ "Councilman Brian J. O’Neill | District 10 | Minority Leader". phlcouncil.com. The Council of the City of Philadelphia. Retrieved February 28, 2018. ↑ Clines, Francis X. (November 4, 1999). "Democrat Wins in a Squeaker Election for Mayor of Philadelphia". nytimes.com. The New York Times. Retrieved February 28, 2018. ↑ Clemetson, Lynette (November 5, 2003). "Philadelphia Easily Gives Second Term to Its Mayor". nytimes.com. The New York Times. Retrieved February 28, 2018. ↑ "Senator Arlen Specter to Teach At Penn Law". News and Stories. The University of Pennsylvania School of Law. Archived from the original on July 2, 2011. Retrieved February 24, 2012. 1 2 "Specter, Arlen, (1930 - 2012)". bioguide.congress.gov. Biographical Directory of the United States Congress. Retrieved March 1, 2018. ↑ Toeplitz, Shira (May 18, 2010). "The admiral sinks Arlen Specter". politico.com. Politico. Retrieved March 1, 2018. ↑ Madonna, G. Terry (February 13, 2015). "Politically Uncorrected: Presidential nominees and Philadelphia conventions". Daily Local News. Retrieved March 30, 2016. ↑ "George M. Dallas (1845–1849) – Vice President". millercenter.org. Miller Center of Public Affairs, University of Virginia. Retrieved March 1, 2018. ↑ "Historical Election Results: Electoral College Box Scores 1789-1996". archives.gov. National Archives and Records Administration. Retrieved March 1, 2018. ↑ Bewley, Joel; Jan Hefler (December 11, 2006). "Four killings put 2006 total over '05 top". The Philadelphia Inquirer. Archived from the original on December 9, 2007. ↑ "Crime Maps & Stats – Philadelphia Police Department". Retrieved January 24, 2017. ↑ "Philadelphia Homicides in 2007". Archived from the original on April 20, 2008. 1 2 "Rankings by Population Group (Top 10/Bottom 10)". Morgan Quitno Awards. Archived from the original on December 11, 2006. Retrieved December 11, 2006. ↑ "NeighborhoodScout's Most Dangerous Cities - 2018: Top 100 Most Dangerous Cities in the U.S." neighborhoodscout.com. Location Inc. Archived from the original on March 5, 2018. Retrieved March 5, 2018. ↑ "2017: Top 100 Most Dangerous Cities in the U.S." (archive). neighborhoodscout.com Retrieved March 5, 2018. ↑ "2016: Top 100 Most Dangerous Cities in the U.S." (archive). neighborhoodscout.com Retrieved March 5, 2018. ↑ "2015: Top 100 Most Dangerous Cities in the U.S." (archive). neighborhoodscout.com Retrieved March 5, 2018. ↑ "Philadelphia becomes largest US city to decriminalize marijuana". Retrieved January 24, 2017. ↑ Davies, Dave (March 2, 2009). "Daily News to be labeled edition of Inquirer; no change to content, staff". Philly.com. ↑ philly.com. Philadelphia Media Network (Digital), LLC. Retrieved December 29, 2017. ↑ "2013 Top Media Outlets: Newspapers, Blogs, Consumer Magazines, Social Networks, Websites, and Broadcast Media" (PDF). BurrellesLuce. June 2013. Retrieved April 30, 2015. ↑ Philadelphia Tribune. phillytrib.com. Retrieved December 29, 2017. ↑ Philadelphia magazine. phillymag.com. Retrieved December 29, 2017. ↑ Philadelphia Weekly. philadelphiaweekly.com. Retrieved December 29, 2017. ↑ Philadelphia Gay News. epgn.com. Retrieved December 29, 2017. ↑ The Jewish Exponent. jewishexponent.com. Retrieved December 29, 2017. ↑ Al Día. aldianews.com. Retrieved December 29, 2017. ↑ Philadelphia Metro. metro.us. Retrieved December 29, 2017. ↑ The Daily Pennsylvanian. thedp.com. Retrieved December 29, 2017. ↑ The Temple News. temple-news.com. Retrieved December 29, 2017. ↑ The Triangle. thetriangle.org. Retrieved December 29, 2017. ↑ "FM Query Results" (archive). fcc.gov. FCC. Retrieved January 14, 2018. ↑ "AM Query Results" (archive). fcc.gov. FCC. Retrieved January 14, 2018. ↑ "#9 Philadelphia PA" (archive). radio-online.com. Radio Online. Retrieved January 15, 2018. ↑ Venta, Lance (October 6, 2016). "WRNB Drops Old School 100.3 Branding ". radioinsight.com. RadioBB Networks. Retrieved January 15, 2018. "...the station’s playlist had shifted back towards Urban AC." ↑ "WHYY Radio & Podcasts" whyy.org. WHYY Inc. Retrieved January 18, 2018. ↑ "WRTI 90.1 Your Classical and Jazz Source" wrti.org. WRTI-FM / Temple University. Retrieved January 18, 2018. ↑ "WXPN 88.5 FM :: Public Radio from the University of Pennsylvania". xpn.org. WXPN-FM / The Trustees of The University of Pennsylvania. Retrieved January 18, 2018. 1 2 "Market Name: Philadelphia, PA". tvb.org. Television Bureau of Advertising, Inc. Retrieved January 17, 2018. ↑ "Nielsen 2017-18 TV Household DMA Ranks: Local Television Market Universe Estimates" (PDF). tvb.org. Television Bureau of Advertising, Inc. Retrieved January 17, 2018. ↑ "Clickable Regional Rail & Rail Transit Map". septa.org. SEPTA. Retrieved January 29, 2018. ↑ Cox (1967), p. 16. ↑ "Renovations to City Hall and 15th Street Stations | History". septa.org. SEPTA. Retrieved January 29, 2018. ↑ Mitchell, Matthew (April 1992). "SEPTA Budget for Fiscal 1993: Continued Rail Retrenchment". The Delaware Valley Association of Railroad Passengers. ↑ "The Delaware Valley Rail Passenger". dvarp.org. Delaware Valley Association of Railroad Passengers. June 8, 1992. Retrieved May 1, 2016. ↑ "Abandoned Rails: The Newtown Branch". www.abandonedrails.com. Retrieved 2016-05-01. 1 2 3 "Commonwealth of Pennsylvania FY2017 Fact Sheet" (PDF). amtrak.com. Amtrak/National Railroad Passenger Corporation. November 2017. Retrieved January 28, 2018. ↑ "Amtrak: Philadelphia, Pennsylvania, 30th Street Station". amtrak.com. Amtrak/National Railroad Passenger Corporation. Retrieved January 29, 2018. ↑ "Connecting Transit Services". septa.org. SEPTA. Retrieved January 29, 2018. ↑ "NJ Transit: Philadelphia 30th Street". njtransit.com. NJ Transit. Retrieved January 29, 2018. ↑ "PATCO Maps & Stations". ridepatco.org. Port Authority Transit Corporation. Retrieved January 29, 2018. 1 2 "Philadelphia International Airport: About Us". phl.org. Philadelphia International Airport. Retrieved January 29, 2018. ↑ "Northeast Philadelphia Airport". phl.org. Philadelphia International Airport. Retrieved January 29, 2018. ↑ "Aircraft Movements: Landing and take-off of an aircraft". aci.aero. Airports Council International. Retrieved January 29, 2018. ↑ "SEPTA Airport Line Regional Rail Schedule". septa.org. SEPTA. Retrieved January 29, 2018. ↑ "William Penn Plans the City". virginia.edu. The University of Virginia. Retrieved January 29, 2018. 1 2 3 "OpenStreetMap". openstreetmap.org. Retrieved January 29, 2018. ↑ "History of the Blue Route". I-476 Improvement Project. Pennsylvania Department of Transportation. Archived from the original on February 19, 2007. Retrieved January 30, 2018. ↑ "Delaware River Port Authority: Our Bridges". drpa.org. Delaware River Port Authority. Retrieved January 29, 2018. ↑ "Burlington County Bridge Commission: About Our Bridges". bcbridges.org. Burlington County Bridge Commission. Retrieved January 29, 2018. ↑ "Philadelphia Bus Station". greyhound.com. Greyhound. Retrieved January 29, 2018. ↑ "Bieber Transportation Group". biebergroup.com. Retrieved January 29, 2018. ↑ "Trailways: Visit Philadelphia, PA". trailways.com. Retrieved January 29, 2018. ↑ "Martz Group: Locations (enter Philadelphia, PA)". martztrailways.com. Retrieved January 29, 2018. ↑ "Peter Pan: Philadelphia, PA Station". peterpanbus.com. Retrieved January 29, 2018. ↑ "NJ Transit: South Jersey to Philly (Market Street, Greyhound Bus Terminal and on weekdays at 30th Street Station)". njtransit.com. Retrieved January 29, 2018. ↑ "Megabus Stops: Philadelphia, PA". megabus.com. Retrieved January 29, 2018. ↑ "BoltBus Buy Tickets". boltbus.com. Retrieved January 29, 2018. ↑ "Trolley Lines". septa.org. SEPTA. Retrieved January 30, 2018. ↑ "Philadelphia's PCCs Return to Service." Railway Age. Vol. 205, No. 10, p. 30. October 1, 2005. ↑ "Trolley Schedules". septa.org. SEPTA. Retrieved January 30, 2018. ↑ "Most Walkable Cities in the United States: 2017". Walk Score. Archived from the original on December 16, 2017. Retrieved December 16, 2017. ↑ "Schuylkill River Trail Named Best Urban Trail in the Nation". Metro Corp. Retrieved February 9, 2017. ↑ "PECO: Company Information". PECO Energy Company. Retrieved January 29, 2017. ↑ "PECO_Investing_in_our_Community_Booklet". page 2. peco.com. PECO Energy Company. Retrieved January 30, 2018. ↑ Maykuth, Andrew (October 28, 2014). "$1.86B sale of Philadelphia Gas Works is dead". The Philadelphia Inquirer. Archived from the original on May 12, 2015. Retrieved April 24, 2015. ↑ Hepp, Chris (December 8, 2014). "PGW deal latest casualty in Philly's Nutter-and-Clarke soap opera". The Philadelphia Inquirer. Archived from the original on May 16, 2015. Retrieved May 25, 2015. 1 2 "Citizen Diplomacy International Philadelphia Sister Cities Program". cdiphila.org. Citizen Diplomacy International Philadelphia. Retrieved December 16, 2017. ↑ "Sister Cities Park". ivc.org. International Visitors Council of Philadelphia. Retrieved June 3, 2012. ↑ "Sister Cities Park History". centercityphila.org. Center City District|Central Philadelphia Development Corporation|Center City District Foundation. Retrieved December 16, 2017.